Education Secretary Betsy DeVos and her corporate friends are about dumping civil rights protections regarding IDEA. Special education has become a means to transform public education into choice and charter schools while ending student services. This is done by defunding special education and convincing parents that services don’t matter. Dismantling services in public schools shouldn’t be allowed. It destroys IDEA protections and drives parents to seek vouchers. Below I list one of the corporations working to end special education. It’s important to remember what life was like before IDEA and not go backwards in time to when children did not get the services they deserved due to learning difficulties. Instead of advocating for more funding support, which should be in her job description, DeVos is working to create opportunity scholarships. Students could wind up in unaccountable online charters, parochial schools, or segregated (students with disabilities only) private schools. Most of these schools are selective and there’s no guarantee they will keep students with learning or behavioral difficulties. Here’s how services are dissolved in public schools. If you are a parent or teacher and have noticed other ways special ed. is being slowly eliminated let me know. Instead of celebrating differences children must conform to standards. When students can’t pass standardized tests teachers are considered failures. Special education with individualized assistance is described negatively. The IEP process becomes confusing, time consuming, and irrelevant. Inclusion is made to look like it’s the only right placement. Students wind up in large classes with little special assistance. When children don’t get academic support parents are told there are better options. Children get vouchers to schools with no public oversight. These schools may remove the child if they have learning or behavioral difficulties. Parents are encouraged to place their child online at home, or in a charter school. Children wind up without quality services. Truthout recently illustrated the drive to end special ed. in a post titled “Does ‘Special Ed’ Serve Students? Disability Activists Say No.” In referencing IDEA they say If only the education provided were as good as it sounds on paper. 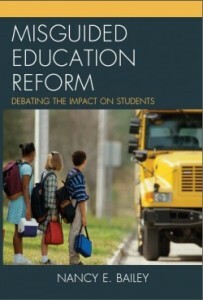 We’re linked to, “An Advocate’s Guide to Transforming Special Education: Creating Schools Where All Students Can Thrive.” This is published by Innovate Public Schools, an anti-public school group out of California funded by the Waltons. They’re fond of Rocketship (online) Charter Schools. They say, For far too long, students with disabilities have been left behind. They often get segregated into classrooms with fewer resources and less challenging work. They receive an easier curriculum that does not give them the skills they need for college or for a career. They remain stuck in the same special education services, regardless of how moderate their disability may be, or how much it may change over time. This isn’t true. IDEA reauthorizations mean that most students with moderate disabilities are now found in inclusion classes. A blog called “Teaching Malinche” tells how Innovate Public Schools has a corporate privatizing agenda to diminish resources for local public schools and open charter schools. 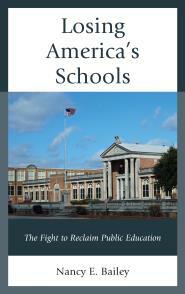 Dr. Julian Vasquez Heilig’s “Cloaking Inequity” also writes about Innovate Public Schools. He begins by saying, Parents and community members in San Francisco have called recently concerned about an “astroturfing” organization that has received several hundreds of thousands of dollars from the Walton Family Foundation seeking to “organize” and “innovate” in the Bay. It appears that the billionaires boy club has taken to heart calls for community-based reform (at least the appearance) as an alternative to top-down reform. On Twitter, Innovate Public Schools highlights Rocketship and glorifies technology. This is the end goal for special education and for all students. End special education services and transform public schools into online charters, or send students home. Provide vouchers that will provide tuition incentives for the wealthy and online charter placement for the poor. But if we lose special education and IDEA, if it fades away like DeVos and the Waltons and all the corporations would like, what will be left for students with difficulties learning? What if sitting a child in front of a computer screen without a real teacher doesn’t work? Where will parents turn? What kind of choices will they have then? As a former Special Education teacher and Anministrator this is all very disturbing. I see similar problems on the horizon for Federal Head Start Programs. Please keep me informed with any needed action steps. Great point, Larry! Any program under DeVos is likely in trouble. Why would they not provide you services for your son in public schools? IDEA means that your son should have been given the assistance he needs. He should have had an IEP team and written goals and a program offered by a special ed. teacher with an understanding of autism. Getting rid of services in public schools is a way to push privatization in this country and it is what I write against. Catholic schools are not known for their special ed. services, and I have no way of knowing what your son is learning other than what you say. Parochial schools do not always share test scores or what they do with the public. In addition, Separation of Church and State raises questions when it comes to public funding going to parochial schools. Many teachers are fighting for special education. There have been marches in many states. I know parents who support and work with teachers. As a retired teacher I work with many parents to fight for public education and special ed. My last few years of teaching I taught a canned reading program. My high school special ed students were ESL, LD, BD, cognitively delayed and on the spectrum. Once the special ed department chair retired , the integrity of the department was slowly undermined. We were all supposed to meet with the general ed department most closely aligned with our subject. The English department didn’t know what to do with us. All of a sudden an ex-bilology (?) teacher turned administrator with a penchant for computer generated data was telling me how to teach. I was expected to teach the program “with fidelity.” I liked the program framework but the rigidity with which it was to be taught undermined professional oversightT he needs of the students were subordinate to the program constructs. I don’t think this administrator ever looked at an IEP although even IEP goals had to be written in operational goals that generally had some quiz like instrument as a stand-in for proficiency. Standardizing and aligning leaves little room for creative teaching. Thank you. All this makes me very nervous for my toddler grandchild, who will be attending school in a few years. Thanks for commenting, Adele. You’re not alone. I wonder what schools will look like with all of these changes! ELL programs are very much like special education. You’re absolutely correct. Often services overlap too. I doubt DeVos is too concerned about ELL either. Thanks, Diane. Good point.